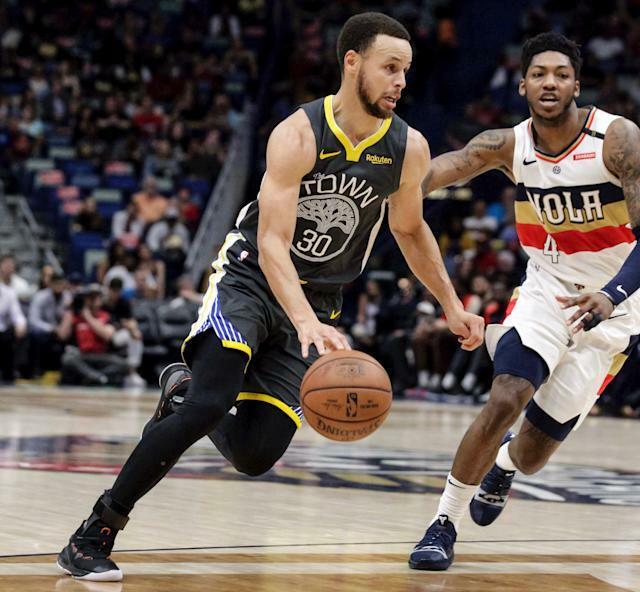 Golden State Warriors guard Stephen Curry left Tuesday’s game against the New Orleans Pelicans after rolling his ankle while planting his right foot during the first quarter. The injury occurred on a crossover attempt and did not involve contact. Curry remained on the court for a short time after rolling his ankle, but eventually jogged off the court toward the locker room. The Warriors later announced Curry would not return to the game “for precautionary reasons” due to a mild foot sprain. Golden State has one game remaining in the regular season Wednesday against the Memphis Grizzlies before the playoffs start this weekend. Curry has a history of ankle problems and has required multiple surgeries on the right ankle he rolled Tuesday night. Head coach Steve Kerr didn’t sound concerned about Curry’s status moving forward, telling reporters after the 112-103 win that he will sit Wednesday’s finale, but that he expects him to return for the first game of the playoffs.